Under direct orders from their commanding officer, Edward and Alphonse journey to a remote city deep within the wasteland borders of Eastern Command. 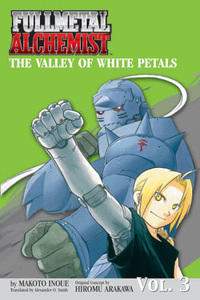 Almost immediately, the Elric brothers discover that Wisteria isn't exactly a normal place. Veiled in shadows, it appears to be a utopian wonderland ruled not by military command but rather by the very laws of alchemy that guide their own personal fate. Like it or not, the brothers must make the biggest decision of their young lives. Do they follow orders and expose the secrets of Wisteria? Or will they allow themselves to be seduced by the paradise they've discovered? Original concept by Hiromu Arakawa and written by Makoto Inoue.